Bangkok is not only the largest city in Thailand – it’s the most visited city in the world. This crush of people can be overwhelming for locals and visitors alike, so many escape to the nearby beachfront city of Pattaya. If you’re looking to experience the white sand beach, nearby cultural attractions, and never-ending nightlife for yourself, but don’t know how to get there, read on. Pattaya is a beachside city just 150 kilometers south of bustling Bangkok. Because of its proximity, Pattaya is a popular weekend escape from Bangkok, and travellers looking for a change of pace. The bus is the cheapest way to travel from Bangkok to Pattaya. It’s a very popular route, especially on weekends, so there is frequent service between the two cities. Of course this also means that the bus is usually quite crowded, and you also need to get to and from your accommodation. There are actually several options for the bus from Bangkok to Pattaya. The most frequent and reliable leaves from the Eastern Bus Terminal next to the Ekkamai BTS station. These “first class” busses are air-conditioned, and depart every 30 minutes between 05:20 and 23:20 daily. There are also buses from the Northern Bus Terminal (Mochit) and Southern Bus Terminal (Sai Tai Mai), though they are less frequent. The Bangkok to Pattaya bus fare costs between B100-120, and the trip takes about 2.5 hours. Travellers are allowed one luggage, and one carry-on for free (up to 20kg). Additional luggage costs B20 per piece, and luggage weighing 21kg – 30kg is an additional B50, 31kg – 50kg is an extra B100, and 51kg – 80kg another B150. There is also a “second class” bus from Bangkok to Pattaya, which costs about B20 less than the first class. These are not air conditioned, and are basically a “local” bus with lots of stops on the way. Though they take longer, and aren’t as comfortable, these second class buses have one major advantage: many offer service from Bangkok to Jomtien. The most convenient way to travel from Bangkok to Pattaya is by car since you get door-to-door service, and the trip is also a bit shorter, coming in at around 2 hours (depending on traffic). The official rate for a taxi from Bangkok to Pattaya is B1500 plus tolls, though you can sometimes haggle some drivers lower. The only problem with taxis is they aren’t always kept to the highest standards, the best way to travel from Bangkok to Pattaya is with a private car service like Daytrip. The friendly local drivers speak English and will help you with your bags, and as an added bonus, you can also stop for sightseeing on the way to see locations like the open air museum Muang Boran, the wooden temple Sanctuary of Truth, or Buddha Mountain! If you’ve just landed in Thailand and are looking to go straight from Suvarnabhumi airport to Pattaya, you’re in luck as you have the same options as from the city center! There are public buses from Suvarnabhumi Airport to Pattaya departing every hour between 5:30 and 22:00. 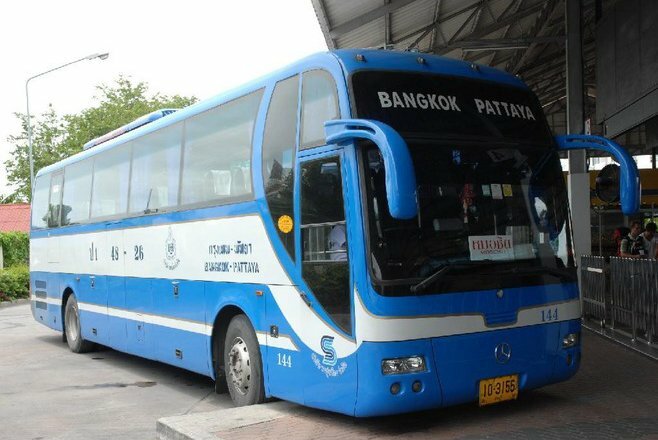 There are 2 different bus companies offering service between Bangkok Airport and Pattaya. Roong Reuang offers busses every hour and the Suvarnabhumi Airport to Pattaya bus fare is B120. Please note: for travellers’ safety, the 21:00 and 22:00 busses only stop at North Pattaya Bus Station. Bell Travel is the other bus company, but it only runs every 2 hours between 8:00 and 18:00, and their bus fare is B300. The bus is a good option if you’re on a budget and not in a rush, though you may have to wait around the airport for the next departure. Like every other major airport, there are also plenty of taxis on hand if you’re looking for door-to-door service. Since the Bangkok airport is on the Pattaya side of the city, the trip from Suvarnabhumi Airport to Pattaya is a bit faster, and a little cheaper. The official meter price is 1050 baht, plus 60 baht for highway tolls is you opt for the express route. However, if you’d like to unwind after your flight and get a taste of Thai culture, a private transfer with Daytrip is the way to go. The friendly, English-speaking drivers will meet you at arrivals to help with your luggage, and safely take you directly to your accommodation in Pattaya. Along the way, they’ll be happy to talk to you about their homeland, and you can experience sightseeing stops on the way from Suvarnabhumi airport to Pattaya!